Some stuff I've been up to…Cellular Weather Station | Watts Up With That? As many people know, weather stations are my specialty. I’ve been busy with inventing a number of things as of late, trying to stay competitive. So thought I’d drop this out there in case anyone has a use for either of these new solar powered weather station systems mentioned below. The US Fish and Wildlife Service just bought one of these for a special project to monitor the weather long term at a sensitive wildlife area. Nothing else would do the job for them. The software is off the shelf, but the system design and production is of my own design. 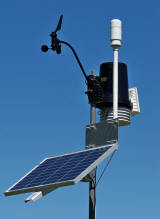 New Solar Powered Cellular Weather Station allows you to put weather data online from almost anywhere. Full featured weather monitoring capability, supports all basic weather data, plus can be expanded for additional data such as solar radiation, evapo-transpiration, etc. Uses the rugged Vantage Pro2 and Vantage Pro2 Plus cabled models. Includes iPhone and Android apps. Guaranteed compatibility with 3G/4G cellular networks in the USA plus international cellular networks including Canada and the UK. Full featured weather monitoring capability, supports all basic weather data, plus can be expanded for additional data such as solar radiation, evapo-transpiration, etc. Uses the rugged Vantage Pro2 and Vantage Pro2 Plus cabled models. Guaranteed compatibility with 3G/4G cellular networks supported in this list. Supports international cellular networks including Canada and the UK. Dual panel solar power battery system will power weather station and transceiver for up to 4 days in total darkness. A complete ready to run weather station web page showing the most recent data, plus automatic data archiving. No FCC license is required to use these stations. Plug and Play operation. No specialized setup or tuning is required to establish the cellular data link. All system electronics come pre-assembled in a NEMA rated weatherproof case with o-ring seal and locking hardware. Includes internal electronics ambient temperature monitor that reports automatically with other data. Ruggedized high quality construction – designed to withstand harsh remote environments. Modular design allows for easy shipping and transport. Complete systems with a weather station include WeatherView32 Professional weather monitoring software for additional data logging, web output, report generation, and alerting via email, pager, cell phone when weather conditions exceed levels you specify. 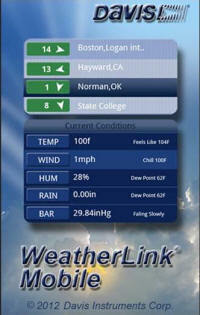 The system includes a LIVE WEATHER WEB PAGE with automatic data logging that you can check from anywhere. Setup and view on any computer, PC/Mac/Linux/Android/iPhone and post your weather data directly to the Internet without a dedicated always on PC. 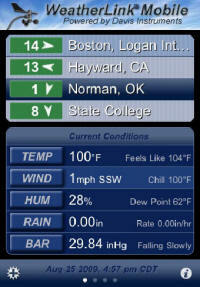 Once the CWS is operating, within minutes, you’ll be able to see your weather data live on the Internet. Selectable data logging intervals from 1 minute to hours. Automatically upload data to third-party weather sites including CWOP, the GLOBE Program, and Weather Underground..
Download the data to your PC for all the powerful charting, graphing, and analysis. Add extra user license kit to download the data independently to multiple PCs—ideal for schools, agriculture, scientific fieldwork, and remote locations. Only thing I’d miss for a long term deployment would be monitoring for the battery state (charge level and an alert when it is recommended to swap it out due to aging). Very nice kit otherwise. Looks great, can we get a version without the tripod? It looks like a stiff wind would knock it over. Maybe a stake in the ground and a fitting to mount it to the stake. 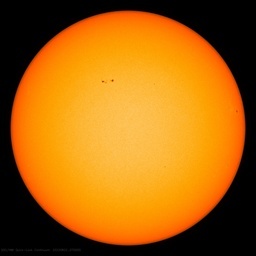 Another observation, does the heat generated by the dark solar cells effect the readings? great for those hard to reach locations on the airport tarmac. What – not coal powered? How have you compensated for the rising heat from the solar panels – surely as bad as tarmac? Solar panels are designed to absorb as much solar as possible and convert less than 40% to electricity leaving the rest as heat! Don’t quite know what a guy wire is, but can I specify the kind of guy I want? What does the kit weight? If it can be back packed to remote hiking locations in Sequoia, Kings Canyon, Yosemite National Parks etc. then it could serve weather information and as an emergency call station where cell coverage is nonexistent. Pretty cleaver, a closed loop regional weather system that climate models can’t screw up. What is your recommended calibration interval? Will you have bearing kits for the anemometer? Good point, I missed the “Comes with guy wire kit for stability” bullet point. I’m not being critical, its very cleaver. Tripod base would be better if the cross supports were at ground level were they could be staked into the ground which would also allow the vertical support to be supported at ground level. FYI, the page you linked to for the list of 3G/4G carriers has a couple of issues – there was server-side ASP code appearing in the header and footer, and “too allow” should be “to allow” in the first paragraph. I’ve seen weather setups along the interstate here in Ohio. Are any of them yours? That is awesome. If I had an extra 4-grand lying around I’d put one in the backyard so I could check my weather on the internet! And looking at the equipment you have at weathershop, a person could actually do a residential setup much cheaper. Really neat stuff Anthony. Anthony has provided a cool way for individuals to engage in the study of weather. Why are you anti-science JJ? Very nice setup there! Enough isolated farms all over the world and hooked into the internet linked WUWTGCN and we’d all be set for some real turkey. Wouldn’t it be great to have an real time hourly updated global average, actual temperature now, no anomalies, across the entire world. One large government could put that into existence on what they spill in a few days to “green” environmentalists. I’ll add it to my list of applications for which current PV technology is price-competitive against the alternatives. Admittedly, it is not a large niche in the electricity market. You have been commenting here as “Bob Gaddrod”, “…”, and “John Majikthise”, amongst others. I thought my post was reasonable – a bit of humour with a real question at the end. I see I am not the only one to question the heat from the panels. Anthony, Are you the WeatherShop? I fly into a remote airstrip and it would be cool to get the current weather for this “private” strip accessing it on the radio – like I can at most other municipal airports. I need to get some other matters in hand first but I seriously might be able to use this. The nearst station is over thirty miles away. I can’t hear it on the ground anyway. As long as he’s wired? Retro-guy wire comes only in raw iron: tough, malleable, but work hardens if you try to bend it too many times. Modern guy-wire can be acquired as soft and weak as pure lead or as strong and durable as braided stainless steel. Choose carefully…. Conversely, gal-wire only comes in silver, gold, or platinum, in my experience. Yes, I’m a ham operator, so my station is registered under my call sign. But you don’t need a ham license to participate in CWOP if you hook your station directly to the Internet via a serial interface. I’ve learned a lot about meteorology by running my own weather station, and derive a satisfaction knowing that my reports are actually used by NWS/NOAA for mesoscale forecasting. There is a free web site, mesowest.utah.edu, run by the Unversity of Utah, which provides an interactive geo-spatial map interface to all of the mesonets, including CWOP. I monitor it all the time to track winds, rain, fires and hurriscanes. And of course, to see my little station chugging out its reports, 24/7. Mesoscale forecasting reports on a much smaller scale than your typical weather.com synoptic forecasts, ideally down to a kilometer or so. So there’s a great need to for additional stations to populate the meso networks. I think Anthony’s kit above is a very cost-effective way for weather organizations (academic, govt etc) to increase the number of stations with very good data and minimal overhead. Compliments. Looks about ready to apply for a NAS grant to install 10,000 around the world to provide quantitative temperature data away from urban heat islands. They would be cheaper, more reliable and last longer than weather satellites. I just wish I had the extra 4-grand lying around too so I could put one in my pasture. I am near a rural airport ~ 3 miles and it would be interesting to track the difference between my pasture and the airport as it expands as it keeps on doing. I know a couple of PERFECT places for such a station to do real climate monitoring. One is in the middle of the Black Rock Desert. NOTHING changes for miles around for hundreds of years and they now have cellular service in Gerlach (except maybe during Burning Man when the cell site would be flooded). That would be a perfect place and even if you had to move the station a mile at some point the conditions wouldn’t change. It would need strong guys, though, as winds can easily reach 70MPH and it can be extremely dusty with flour fine dust. readings”. What is the accuracy, with/without, for temp and humidity measurements? All it needs is a camera to spot the ‘Barbeque’, er tampering. If you could add a vocalization unit, and a transmitter interface it might be usable as an AWOS for a small airport. MacTheKnife, I don’t care much for gold, silver or platinum. I prefer brass. Anthony, if you are hoping to sell your unit here in Australia and I see a market, be aware that solar powered relay stations commonly used here to provide telephone services in remote areas drop out after 5 or 6 days of heavy cloud cover. So you might look into additional battery backup. I suggest you revise your junior high school physics John from CA. Compare the heat sink of solar cells with that of black tarmac. Different ball park. Add to that the positioning of the various component parts, obvious in the photo. Me too! That’s the difference between my experience and my preference, que lastima! Are you considering making a Windows Phone app as well, if not for the current version, then for Windows Phone 8 that was just previewed? No need to revise the laws of physics. It’s well known that black solar photo-voltaic cells generate heat as well as electricity. So it’s possible that the panel could get just as hot as black tarmac. With regard to component parts positioning, it looks like the solar panel is located just inches away from the aspirator for the thermometer. Also, the panel is tilted such that air behind the panel could be heated and rise up close to the aspirator, which might affect the readings. Hopefully the kit could be assembled with the panel further away from the aspirator. I hope you become rich and famous. You are already famous! This country and wealth was built on innovation. Good luck. If you will build it outside of California I would like to apply for a job. My dream kit would also include infrasound measurements (in particular 2-5 Hz) and would be able to measure changes in the atmospheric efield from about that high off the ground. That would be incredible to measure during storms, or before and after rain. I would love that. And it all would get archived on the computer. One of my “someday projects” is to get a small recording thermometer set and put one over the driveway, and one over the lawn (and maybe one near the road and one in the back yard under a tree…) All inside 100 feet of each other. Then show exactly how much “microclimate” changes the results. I’m quite sure that “over the tarmac” and “near the road” would be at least a degree warmer than under the tree… But having a direct record of that from matched instruments would be ‘golden’. Can you recommend a device for that? At one time I think you had a little recording thermometer thingy for not too much money. Any chance of a “feature” on it, too? The solar panel doesn’t have much mass compared to tarmac which is probably why Anthony’s tests don’t show any bias. What I need, Anthony, apart from fluency in Portuguese and knowing what Ecotretas is up to these days, (oh, and beautiful girlfriends), is a system I can mount maybe 100 feet from my home (up a tree) and still receive data, either on demand or, preferably, automatically downloaded to my PC. WiFi will not allow placement of a personal weather station far enough away from my residence to not be contaminated by the house. Mabe a cable system from the sensors to a wifi node close to my home. A reasonale distance from my home must be 100 feet plus; but I am in a high-denisty suburb, with trees. So it should be mounted atop a tree. The Vantage Pro2 (in Anthony’s Celluar Weather Station) and the Vantage Vue both come equipped with a solar powered transmitter with a range of 1000 feet. But you don’t want to mount it in a tree. The branches will interfere with rain and wind measurements. Roof mount or on a sturdy mast, with the anemometer preferably about 20 feet above the ground, clear of obstructions. But make sure that you have easy access to it, whereever you put it, because you’ll have to replace batteries and clean it every 18 months or so. Central spike anchor, (like a stop sign) to secure and ground the unit. Drop the control and battery boxes to the lowest point. Use a desulphating solar charger (does it exist?) with lead acid batteries, and you could get 5 years on the batteries. Inventions do change the world, no? How do we WUWTers apply for some of that climate thingy grant money? I’d like to install a small flotilla of those sensors. That is, place a grid of sensors starting from our local town center (where our local temperature measurement sensor is for NOAA) out till sensors are mounted in rural farms and fields. This is a far easier concept to try out with a small country town than trying to grid the large eastern megalopolis centers. Just to see what the UHI ‘is/is not’ for a largely brick town, suburban edges and rural country surrounding. I live outside the town in one of the rural areas and have been intrigued to see the local news claiming new record highs the last few years. Especially as when I first moved here we were always within a degree when the temperature was announced. Yeah, I know, my old max/min mercury thermometer just isn’t up to snuff anymore. A few million dollars wouldn’t even be a few drops out of the billions the climsci (pronounced like clumsy) group have been spending and it would be for direct observations that avoids models, statistics and corrupt scoundrels. It’s a shame these sensors can’t be mounted vertically for a few thousand feet. Then we could test Willis’s theory about weather having a self limiting feedback factor. Belize might be a good place to try that idea out. WiFi will not allow placement of a personal weather station far enough away from my residence to not be contaminated by the house. The Wi-Fi n protocol has a outdoor range of 820 ft (250m). Anthony, as a fellow inventor with two issued patents and several pending, let me suggest….”military contracts.” They’d love this! Practical query: Despite the smallness and cheapness of my ‘supermarket grade’ weather station, I’m regularly impressed at how well it manages to forecast the next few hours’ conditions. Does anyone know where I might find some details of the sort of algorithms built into these things? Searching on the net I find mentions of b-i-g all-singing, all-dancing (commercial) programs, but I want quick’n’dirty calculations which will fit either into a PIC (like the supermarket model) or a program small enough for one (very) amateur programmer to work with. Any suggestions gratefully received! > sort of algorithms built into these things? I believe many of these weather boxes (including the Vantage Pro) use variations of the Sager algorithm, which dates from 1942 and was originally implemented on a custom circular slide rule. A serious suggestion: for remote locations, you might want to include a level switch so if anything knocks it down, it will immediately send “Help! I’ve fallen and I can’t get up” or some such message. Well done, Anthony. I have forwarded your post to contacts in the Wide Brown Land (Australia) which is always in need of weather monitors, especially since the BOM started cooking the figures. It’s a snip at the price. Excellent! Really, a 1942 algorithm is still widely used? I am not being critical, at all, but do wonder how the newly minted algorithms that currently inform climate models will look in 70 years or so. And yep, I have one of the simplest algorithms right in front of me every time I look up. It is a lovely circular barometer/thermometer set in an old piece of fence post. It is interesting that if you look at old movies and even old TV shows, every house had a barometer. But, in modern flats/apartments and houses, both in real life and the media, they are absent. Two questions arise. One, where have they all gone? Are our landfills chock full of unloved barometers? And two, does it reflect urbanisation? If you live in a city, the weather matters much less. Maybe our parents only had a barometer out of tradition anyway. The combination of my barometer, the local weather maps, and my arthritic knee consistently outperform the BOM forecasts. And I live in a small city. But, weather afficiandos, many of whom inhabit WUWT, are perhaps a bit of a species apart, or tribe. > Really, a 1942 algorithm is still widely used? Probably not used much by professional meteorologists, but seems to be used a lot in the mass-consumption, Walmart-class (and higher, like Davis) weather boxes, which tend to use low-end microprocessors like PIC, where code and data space is very limited. … but to requires considerable skill and knowledge of FORTRAN compiling etc to get it running on real data. A better alternative for aspiring amateur meteorologists would be to interactive with WRF on line using Joe Murgo’s nifty web page (http://webpages.charter.net/wxjoe/animator.htm) which lets you interact with different weather forecasting models and create animated weather maps. A lot of these models are WRF-based, using state of the art “Data Assimilation” algorithms (http://en.wikipedia.org/wiki/Data_assimilation), which take prior conditions as baseline and assimilate new observations for predicting future states of the model. I can’t recall anyone ever discussing calibration intervals. For weather stations in general, especially the ones used to calculate “global warming”, how often are they calibrated, and are the calibration dates recorded with their data? And can we simply ignore weather stations and data that has never been calibrated properly? I’ve been using Open2300 (http://www.lavrsen.dk/foswiki/bin/view/Open2300/WebHome) on a LaCrosse Ws-2300 for several years now (http://classic.wunderground.com/cgi-bin/findweather/getForecast?query=05341). The station is up on the roof with a 900 Mhz radio to the console. Also built a web page for a Vantage Pro (http://www.swantown-wifi.portolympia.net/), uses a Troy Serial/Ethernet convertor to talk to the remote VWS server. you can also add a very cheap Ubiquiti WiFI link (http://www.ubnt.com/) to extend the range for at least 30 km. Some deficiencies are easily corrected, such as normalizing air pressure to sea level by adjusting an offset parameter. Others, such as equipment malfunction are harder to fix. Here’s the last QC report for my station, which has consistently been rated “OK”. @John Day – Many thanks for that, John, now I have something to hunt down and get my teeth into. I’m less surprised than some at the age of the algorithm, as it dates it firmly in the Traditional Uncorrupted Science era; better still, if it can fit on a slide rule it will probably fit in a modest memory – electronic or mine! Yes, the algorithm is seems to be very compact, and doesn’t need many input features. Backing and veering winds reflect a change in wind direction with altitude, so not clear how a single anemometer could figure that out. Perhaps there’s a heuristic for estimating the advection and rotation from short time series samples. Or maybe one could use the variance of the wind direction as a crude proxy for this. Also you would need a solar radiation sensor to infer cloud cover. They’re readily available, but not usually included in the typical home weather station. Again, maybe one could use short term variance in temperature as a proxy for cloud cover. In any case, I think I would try to come up with my own algorithm with whatever features my station provided, using local historical forecasts extracted from NOAA archives and time-series or decision-tree modelling tools. (R, Weka etc). Oregon Scientific has a wireless weather station that you can interogate up to 10 combination temperature /humidity sensors. To do that you have to knock off the other included sendors (barometer, wind, etc). Range is posted as 100m with no obstructions. There is software to download data, but I couldn’t determine from the info if it’s continuous or not.